A 40 min. introduction to English country dancing that explains the structure and teaches some of the basic moves. It's a great way to give newcomers confidence and to show friends what it is all about. Click for more info including a link to YouTube with a 10min. clip from the video. 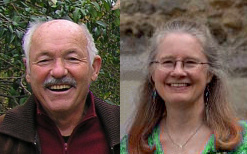 Scroll down for the Contra Dance DVD. 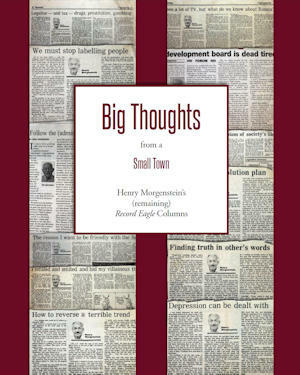 "Big Thoughts From a Small Town"
This is a collection of the best of the rest of his newspaper columns from The Record Eagle in Traverse City. "Joyous Dancing - Contra and English"
A collection of essays about dancing - mostly Contras and English Country Dancing but also Irish Sets, Scottish, E-Ceilidh, Calling... With 34 of Jacqui's photos. Get the kindle edition from Amazon or the paperback book from CDSS. is a collection of some of his best newspaper columns, radio talks and other essays, mostly about his home town, Traverse City, MI. "The Explosion of Administration & Other Tales From The Teaching Battlefront"
is a collection of his newspaper columns, radio talks and other essays on teaching at Northwestern Michigan College (NMC). You can also download the "Explosion of Administration" story alone: Click for download page. Henry's essays and quotation collection. Also a short biography. Henry has become the family historian for their escape from the Nazis in WWII. The story is here. Henry's talented son and daughter-in-law, Ben and Sarah, have a great food blog. One of their recipes recently won a competition! Henry is now a guest contributer to Gary Howe's terrific blog MyWheelsAreTurning.com. The blog is full of fascinating articles and news about bicycles and cycling in Traverse City.